Colorgram is Now Among Apple’s Latest Favorites! After just a year of being on the App Stores since its inception last year, our 2nd app, Colorgram, has recently reached new heights on the global market! 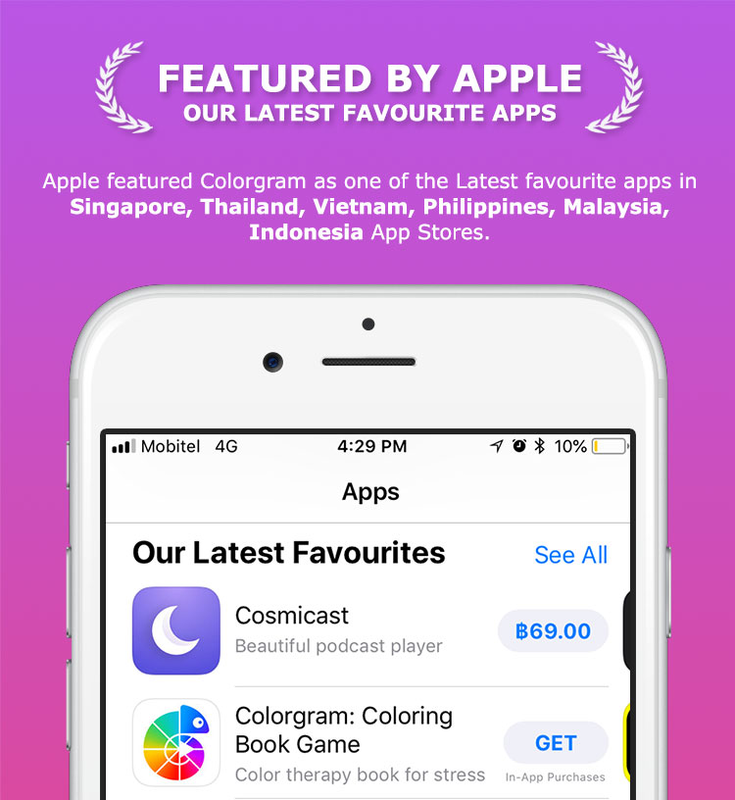 We’re super excited to bring you the news that Colorgram has been handpicked by the editors of the App Store to be featured on the “Latest Favorite” list of the App Stores in Thailand, Vietnam, Philippines, Malaysia, Singapore and Indonesia! Also being the first in Sri Lanka to achieve this definitely makes it a stepping stone for the app and for the Colorgram team who’ve worked endlessly to bring it to life! With its playback feature, Colorgram offers its users a chance to appreciate colorings in the form of soothing videos that display the user’s final coloring process from beginning to end. We feel that this feature encourages users to give meaning and order to their coloring process which they can then fully appreciate through the playback videos, giving them a whole new understanding of the simple act of coloring a picture. In addition, the in-app community of users makes for a great place for Colorgram users to bond over their shared love of art and coloring, where they are able to like and comment on the colorings of others to show their appreciation! With every comment, share, like and retweet, we’ve managed to bring Colorgram to this new high and we couldn’t be more thankful for it! So here’s to another year of Colorgram on the App Store full of progress and reaching milestones! Celebrating 6 Years of Taking 4Axis Up the Global Ladder!